One of the most beautiful aspects of the banjo is in its tuning. For beginners, there is nothing more satisfying then playing the banjo in its regular open G tuning, and hearing a nice clean banjo chord. Even with no prior experience playing the banjo, you can still pick openly and have it sound rather nice (unlike the guitar with its unfinished E tuning). But picking an open G only goes so far, and ultimately it is time to learn the other chords. 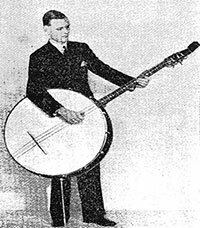 The neck of the banjo is much smaller than a guitars, and for the most part, the chords are easier to play. There are no difficult F barre chords requiring years of hand strengthening, and in fact most banjo chords only call for a few, closely placed fingers. The G, C, D combination is the easiest and earliest to learn on the banjo, and once the transitions are comfortably down, you can play a wide array of tunes. Add a simple two fingered E minor into the mix, and the world of Bluegrass and Old Time music is at your fingertips. The remaining major and minor chords are similar to these four, and for the most part do not require much, if any, strain in playing. With a neck only four strings wide (at the top) and seldom as thick as a guitar, the barring of chords is rather easy and not too strenuous on the hand. Simply put, you don't get that throbbing thumb feeling that you often experience when playing barre chords on a guitar. What makes the banjo a difficult instrument to master, is that after you've memorized the basic chords and getting their transitions down (like any instrument), you need to then master the style you wish to play (finger picking, clawhammer or frailing). So while one hand is learning the banjo chords, positions, and transitions, the other is busy learning and practicing a particular striking style. It's almost as if each hand has to learn its own separate instrument. But once the basics of chords and picking the banjo are down, and you feel comfortable moving around the first 4 frets, the excitement of the instrument begins to unfold. There are nine basic chord positions to play, between the major, minor and seventh chords, and for the most part, they are simple extensions of the chords already learned. Once the variations are learnt, and you can remember the positioning of the chords throughout the neck, it completely unlocks the banjo. You can play your simple G, C, D progression again, but in changing the variations of the chords (up and down the fretboard), the entire tone changes. You can start to hear and learn the fills and rolls that are associated with Scruggs' three finger style, and it opens up a new world of banjo picking. Speed comes with practice, but it's in learning the chords and their variations that really makes banjo chords an enjoyable endeavor.